Madrid's famous central arcaded square dates from 1619 and was built by Philip III, whose statue still stands in the centre of the cobbled expanse. In medieval times the Plaza de Arrabal, as it was then known, was the venue for numerous public spectacles, ranging from knights' tournaments and festivals to the burning of heretics at the stake. The buildings surrounding the square, once made out of wood, were burnt completely to the ground three times, in 1631, 1672 and 1790, but always meticulously rebuilt, the final time producing the design we see today. The most famous building on the square is the Casa de la Panaderia, which predates the plaza, but has also been rebuilt several times. The Plaza Mayor was always intended to be a public gathering space, and has been used for bull fights, royal events and military parades. It remains a public gathering place, and is still the epicentre of certain celebrations in Madrid, but the majority of people who congregate in the sidewalk cafes to sip sangria on summer nights are tourists, enjoying impromptu music performances and watching the passing parade. 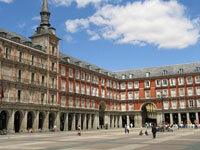 The Plaza Mayor is invariably a stop on sightseeing tours of Madrid and well worth a visit.